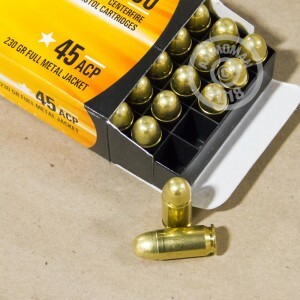 Shooting .45 ACP doesn't have to cost an arm and a leg when you use Armscor ammunition. This bulk priced case offers a hard to beat value, combining reliability, quantity, and affordability in a package of 1,000 rounds. 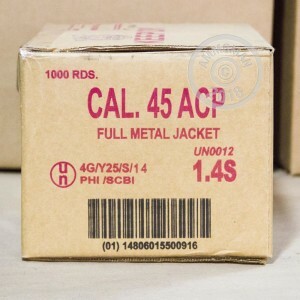 Each cartridge in this case fires a 230 grain full metal jacket bullet at 849 feet per second. This combination of a relatively heavy bullet fired at a low muzzle velocity is common for the .45 Auto. 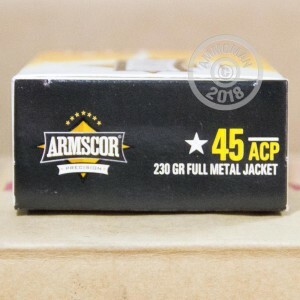 Armscor ammunition is made in the USA and the Philippines using non-corrosive primers and reloadable brass. Pick up this case of 1,000 from AmmoMan.com to get free shipping! it goes bang when you pull the trigger. 2 or 3 of the rounds in this lot of 1000 were headspaced too low. but that's what you get with cheap ammo. Had a minor problem. FedEx informed me that the shipment was damaged. I contacted Ammoman and they took care of it immediately ! I now have another place to order ammo. Have not fired any out of this batch as it was bought for storage but Iv'e not had any problems with it in the past. This ammunition is not bad, but some of it is made in the Philippines and the quality is a little off compared to the ones made in the USA. The ones made in America say it on the box, if it does not say it on the box it is made elsewhere.